I think I should make a note here. The actual tour was scheduled to start today, in the afternoon, when most of the other people on this trip were scheduled to arrive. We came a day early to acclimate (Moscow is three hours ahead of London and eight hours ahead of New York). Behavior like this is usually totally unlike me, as I am a rock solid procrastinator of the first water. I blame the influence of my wife. For the record, she is one of those people who would get her school assignments done the day they were issued instead of waiting till the night before they were due. Yes, she’s one of those people. Since we had an entire morning free, we decided before we arrived to add on something that wasn’t in the tour itinerary. We paid a little extra for it, but we thought it was well worth it. After a lot of research, we settled on the Memorial Museum of Cosmonautics. Essentially a museum devoted to the then Soviet and now Russian Federation space program. Unusual, and the museum is located in a non-central location so there isn’t that much tourist traffic. Great for us. Our guide, from Exeter, Anna would also be the one accompanying us on all the other individual tours through the rest of our time in Moscow. Simply put – she was awesome. One of the best tour guides we’ve ever had. Anna was great fun and had a wicked sense of humor. 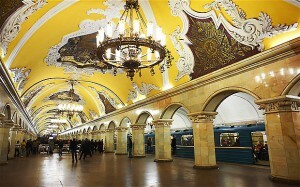 To get to the Memorial Museum of Cosmonautics, we had to take the Metro, the Moscovite subway system. More on the Metro later. 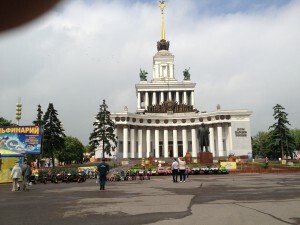 Cars were available, if we insisted, but traffic in Moscow nowadays would turn the hair of a New York cabbie white. Therefore going underground is preferred over aboveground. 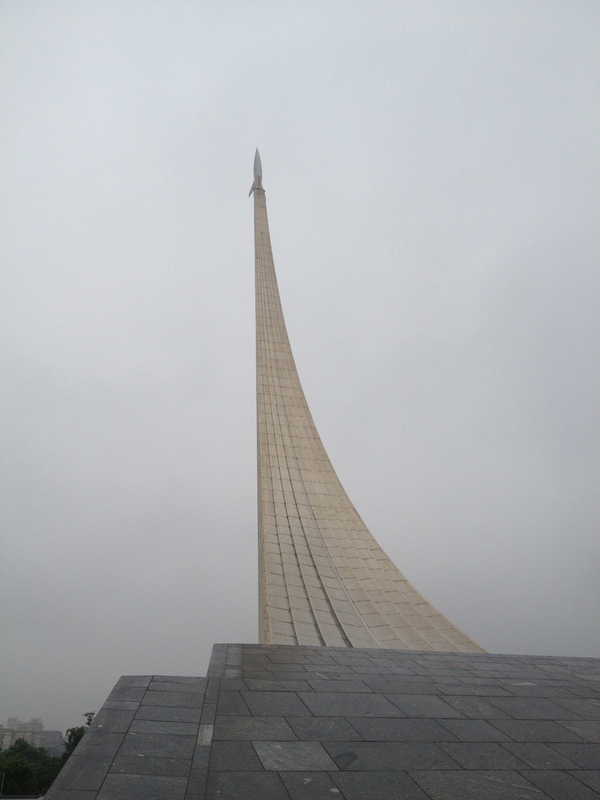 To the left is the monument that marks the location of the Cosmonautics Museum, a rocket taking flight. Interestingly enough the museum is under the monument, so it’s really pretty much underground. 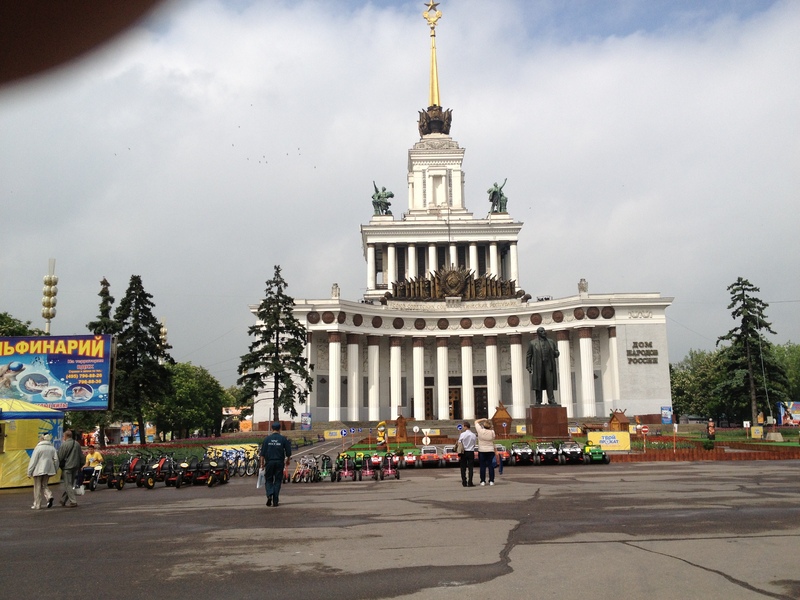 Weirdly enough, this is not the only underground museum we saw in Russia. Oh, and the scales on the monument are titanium plates, which pleases me for obscure reasons. Inside there’s lots of great exhibits, stuff you’ll never see in any Western museum. 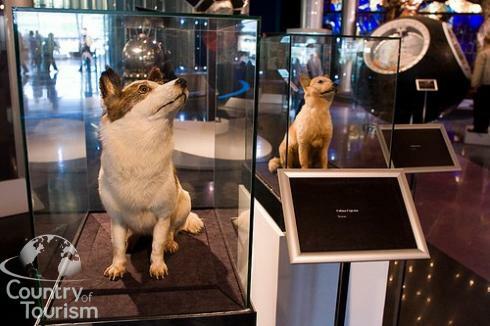 Including the taxidermied remnants of two of the dogs that preceded the cosmonauts to space. I call them the CosmoMutts. They seem slightly bedraggled which is either because the taxidermy isn’t totally top notch, or because the dogs were mutts and thus bedraggled from the start. Plus they were launched into space, which for a dog, probably isn’t one of the most fun things you can do, mainly because you can’t stick your head out the window. We spent a fascinating morning in the museum and it was indeed fortunate that we had Anna accompanying us as the informational plaques were almost exclusively in Cyrillic. My Cyrillic is pretty much non-existent. Mary actually downloaded an app and practiced hers before we arrived, and she was pretty good at it, and able to figure out all sorts of things. As I said – she’s that person, not only does she get her assignments done when they’re assigned, she studies for extra credit. Afterwards and since we a hop, skip and a jump away, Anna asked us if we’d be interested in seeing the grounds of the All-Russia Exhibition Center. Originally built in the Thirties, when it was called the All-Union Agricultural Center, it was then retitled the Exhibition of the Achievements of the National Economy in the Fifties. I have to admit I like the last title the best. Really rolls off the tongue. At its peak, the All-Russia Exhibition Center was bigger than the Principality of Monaco. According to Anna, when she was a child a trip to the Center was sort of the Russian equivalent of a trip to Disneyworld, Rockefeller Center, the Smithsonian and the World’s Fair all rolled into one. Lots of the pavilions still exist and are used for a variety of purposes today. 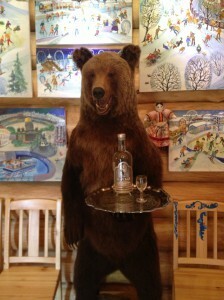 We spent a couple of hours wandering the grounds and sitting in the shade and sampling Russia soft drinks, which for informational purposes I can confirm contain more fruit flavorings and less sugar and carbonation than American sodas. 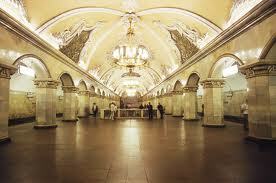 Finally, we went for a mini-tour of the Moscow Metro. First started in the Thirties the Metro now encompasses a total of 188 stations, all of which are unique. The designs and materials for each of the stations was originally dedicated to the celebration of the Soviet state and people. Amazing stuff really. Here are some pictures from several of the stations we did visit. The final event of the day was a cocktail reception at the hotel for all of the guests in our group. There we were able to meet everyone except one couple that had some missed connections and who wouldn’t arrive till later in the evening. After a couple of glasses of champagne and some nibbly bits we collapsed into bed. Tomorrow would be, if anything, even more exhausting.